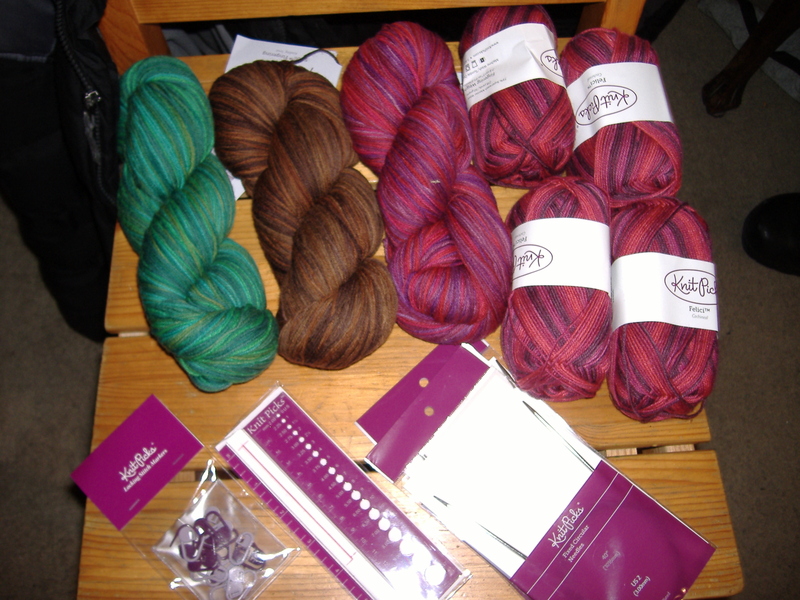 I haven’t been doing too much knitting the past week or so, but I have been getting a lot of mail. First off are two books that I picked up from Amazon. 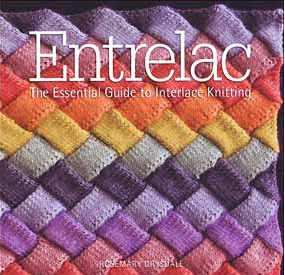 This was purchased on a whim when someone recommended it to me — Entrelac, The Essential Guide to Interlace Knitting by Rosemary Drysdale. I’ve only done a quick perusal of it, so I don’t have enough to give it a proper review. At first glance though she shows you how to do some really neat things with entrelac. I’ve loved entrelac knitting ever since I first saw it years ago. I even made my oldest’s Christmas stocking in entrelac as well as my favorite pair of fingerless mitts. I’m out of practice with doing it though so I’ll use the instructions in the book to make a few swatches. Look for a full review in the coming weeks. 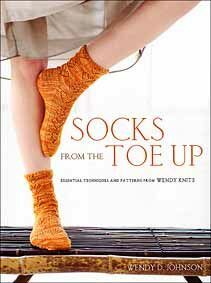 This was a no brainer — Socks From the Toe Up by Wendy Johnson. I used to follow her blog when she first started out and my first couple of pairs of socks were knit from the toe up (I even converted Pomatomus to toe-up). I’ve only been using top-down for the past few years because of my high instep and the better fit I get with a heel flap. After the rave reviews I’ve gotten about this book from Super Stella Sox and a few others, I finally decided to get the book. At first glance I’m pretty excited. It doesn’t have too much information on adjusting fit which is my big beef with most sock books, but it does have a heel I’ve never tried before and I’m pretty sure I can alter it to accommodate my high instep. 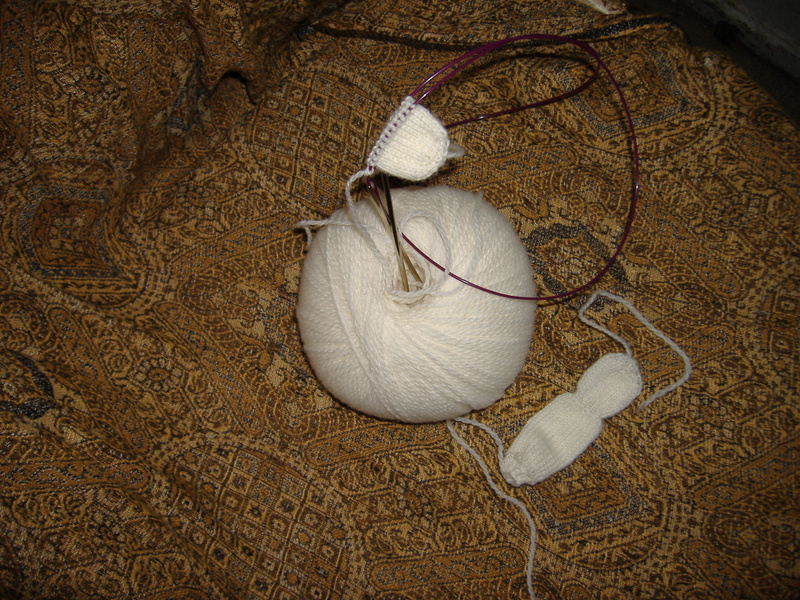 I also look forward to using the Turkish cast on and a sewn bind off again which are both things that I love. Again, once I’ve gotten to play with this a bit more I’ll post a full review. 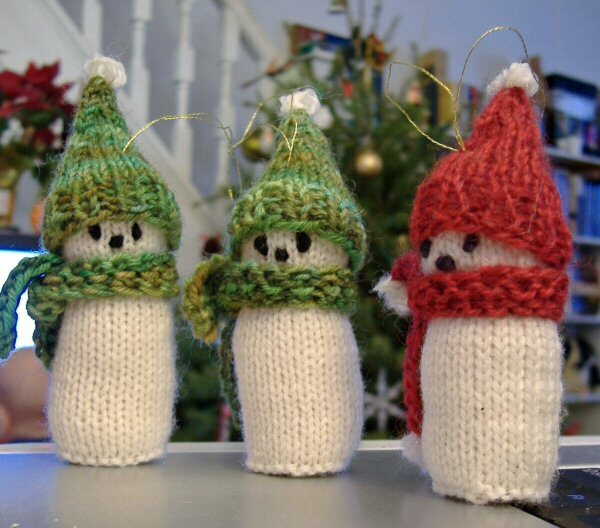 This year I’m going to attempt to make my kids matching sweaters for Christmas. 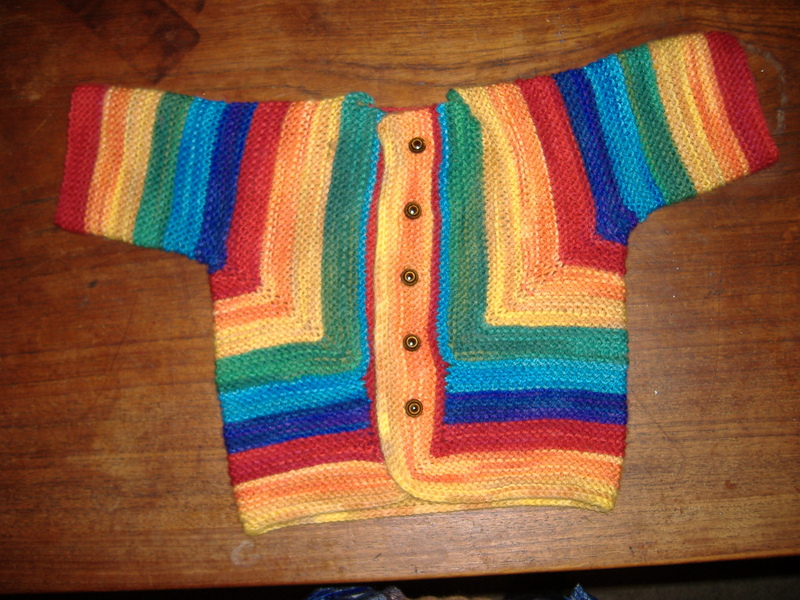 I had grand plans for this about 4 years ago and got as far as designing the cable patterns and actually making a sweater for my youngest (which he never did get around to wearing). 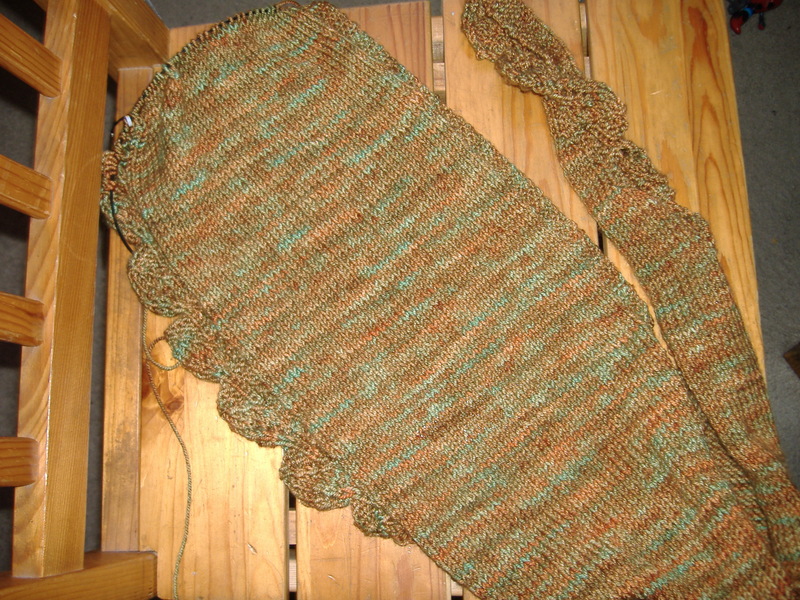 I’m thinking of using the same cable pattern again and making them ganseys rather than full cable knit sweaters. 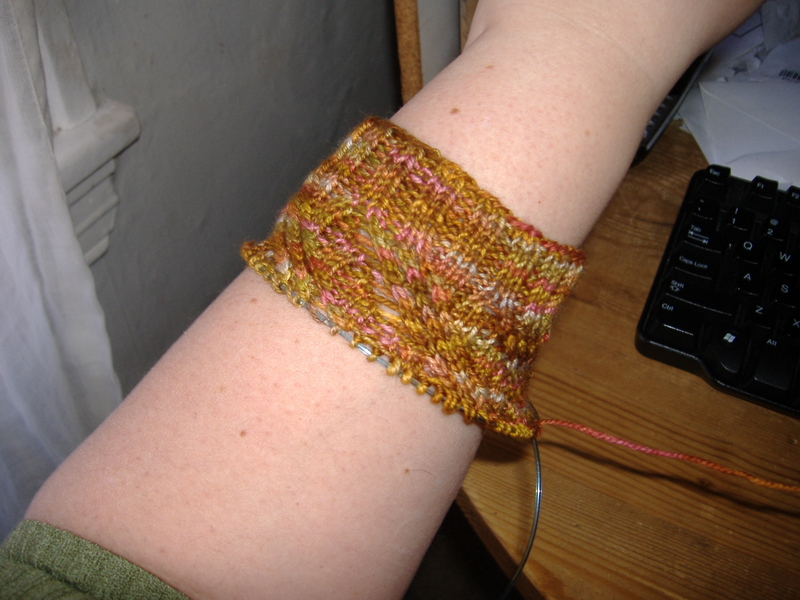 Not the best picture of the swatch, but I already have it charted out so it’ll be easier than starting from scratch. I decided to let them pick out the colors they wanted for their sweaters and after a few false starts with garish shades of yellow, I got them to agree to a nice burnt orange color. 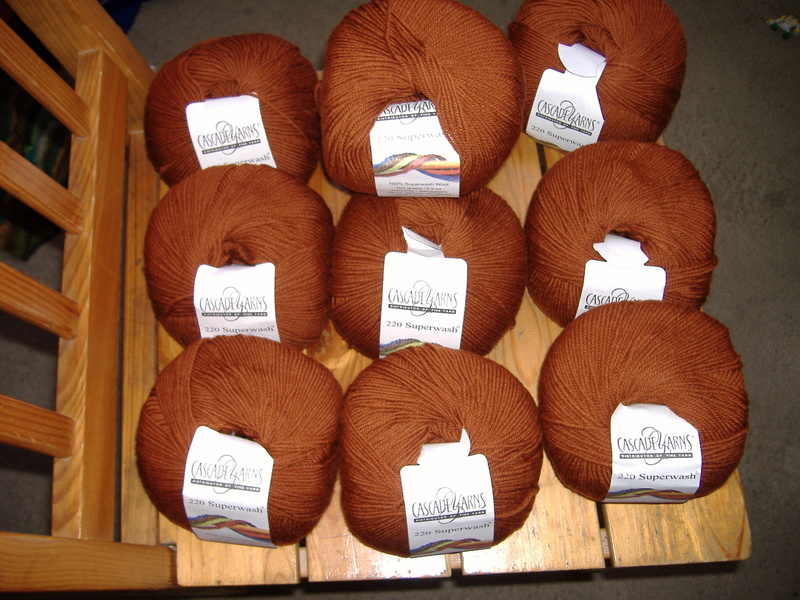 Webs is having a sale on Cascade 220 superwash, so I was able to scoop up what will probably be too much yarn for a really good price. This project won’t be started until probably this summer at which point I’m sure I’ll have changed the design of the sweaters at least five times. In WIP news, I’m in the straight section of my Saroyan scarf and should be starting the decrease section after a few more repeats. I love knitting with the pashmina and I’m looking forward to finding another excuse to use it again. 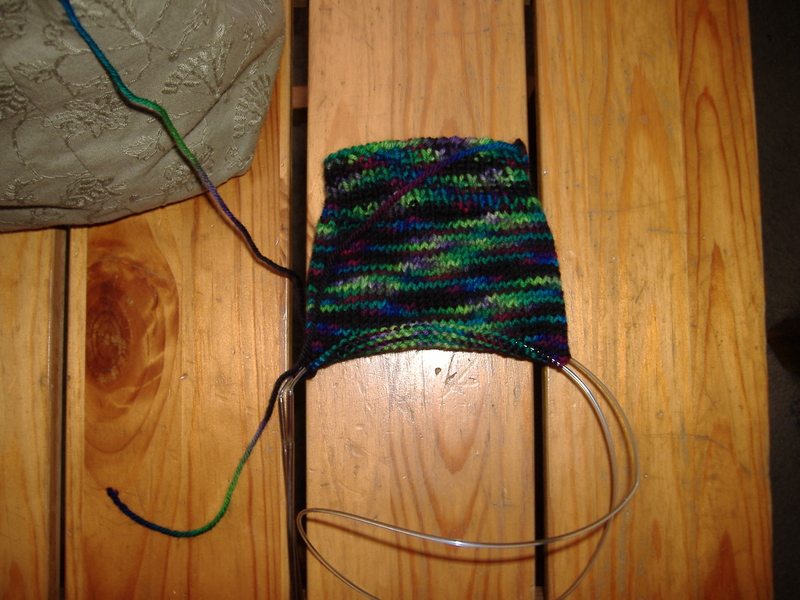 I’ve also started working on my second Black Magic sock. 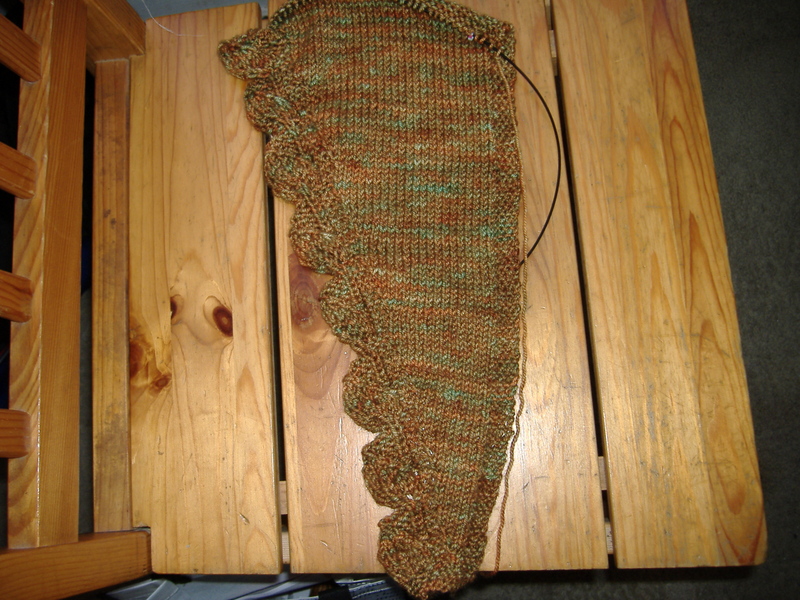 The Saroyan is my main project, but I need to be able to read the chart so it’s not as portable as a sock. I usually tend to work on it while I’m waiting for the kids to fall asleep because it’s simple enough that I can knit it by the light of their night light. 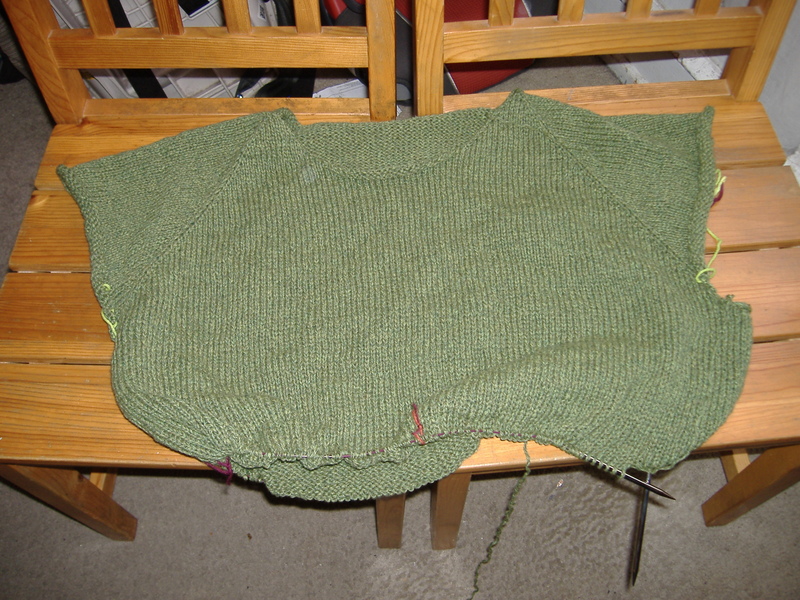 I still haven’t touched my green sweater and I’m going to have to get it finished soon or I’ll have to wait until the fall to wear it because the weather is rapidly changing. I’m hoping I can push myself to get some work done on it this week for sure. 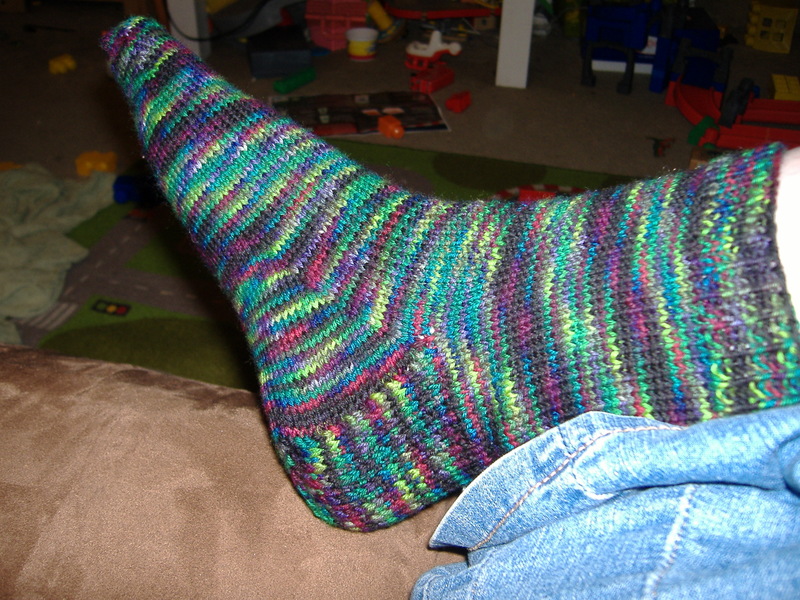 This is the first Great Adirondack Yarn Co Caribou sock. 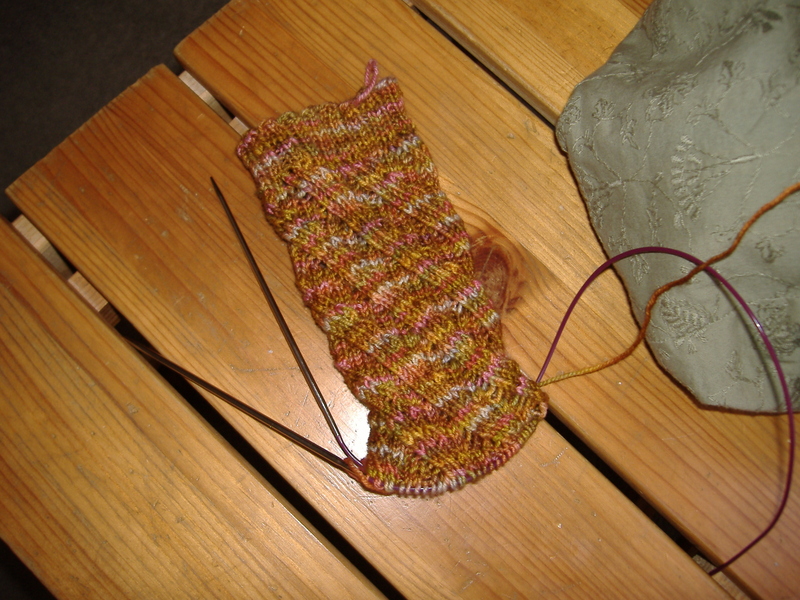 It’s just a simple stockinette sock with a heel flap. I finished it last week but couldn’t muster the energy to cast on for its mate. I decided to succumb to SSS (second sock syndrome) and do something else until I cast on for the second one. 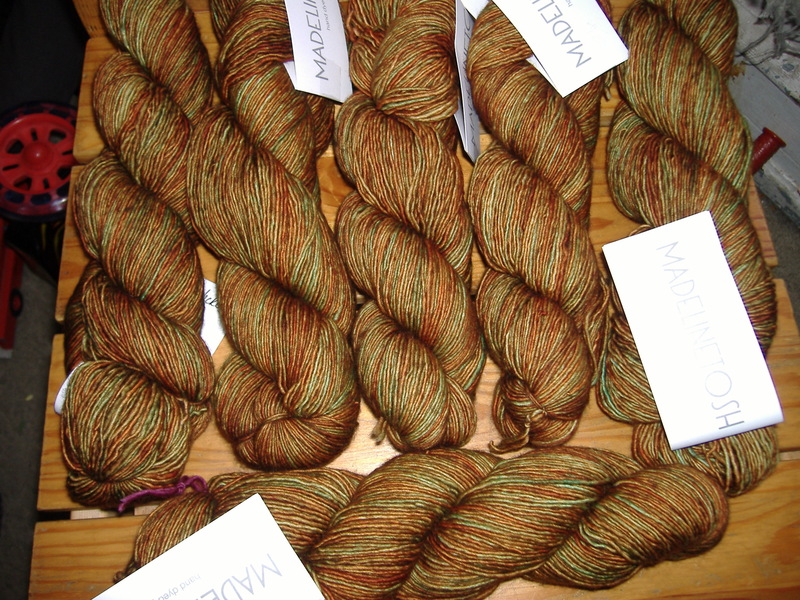 After surfing through Ravelry for an hour last Friday night, I settled on Saroyan with the Madelinetosh Pashmina that I bought at Knitty City. 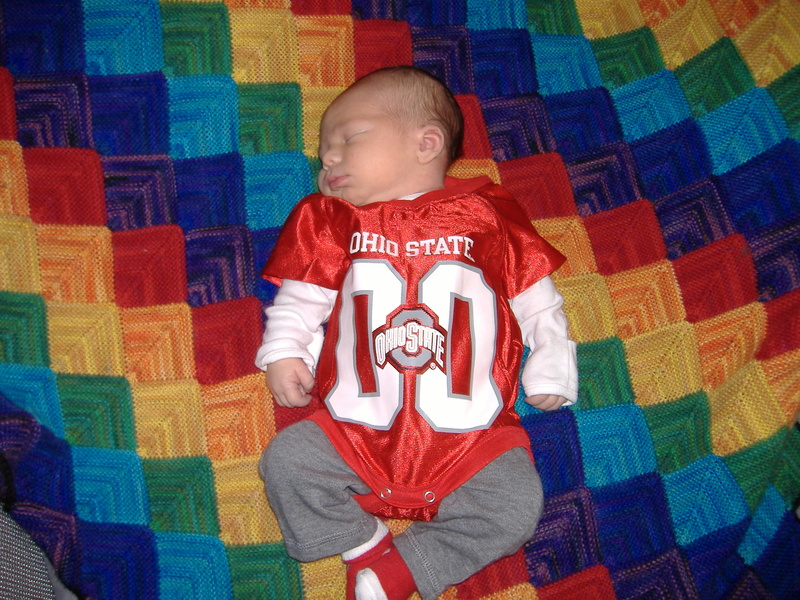 The pattern is written for worsted weight yarn and the Pashmina is sport weight. I’m still using the US Size 8 (5.0mm) needles that the pattern calls for but I did 10 increase repeats to the 6 as written and will probably end up with about 14 repeats in the straight section. I could have done a few more increase repeats, but I’d like to have a little bit of yarn left over for another project that is in the works. I’m having the worst time memorizing the chart for the leaf pattern on the one side so it’s not mindless knitting since I have to pay attention to where I am in the chart. I’ll probably cast on for the second Black Magic sock tonight so I can have something that I can just whip out and work on when I have a spare moment as opposed to having dedicated time to work on Saroyan. 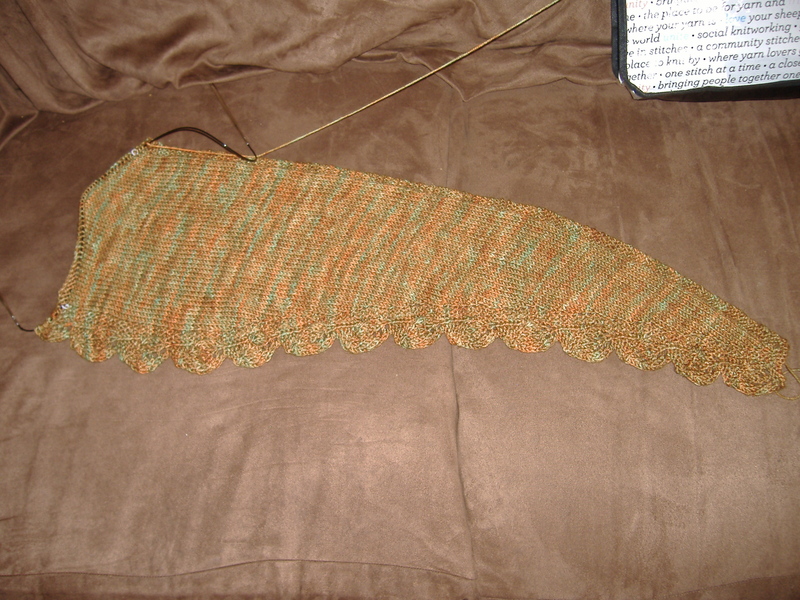 In other WIP news, my green sweater has stalled. I was all gung-ho about trying to get it finished in enough time to wear on my New York trip but when I realized that just wasn’t going to happen, I lost all my steam to finish it. I’m planning on making some time this coming week to get the sleeves done so I can finish the body of the sweater. The weather will be changing soon and I’d like to have it done to wear this spring while it’s still too cold to wear just a tee shirt but not cold enough for my coat.